"Here's a good shot of Twendy-One leaning all the way over to pick up a soft plastic ball. 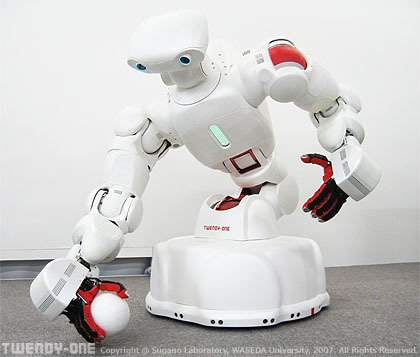 (Twendy-One picks up a ball from the floor) "
"Reminds me of the robot from the movie short circuit." "It's Flexible Frank from Heinlein's "The Door Into Summer."" "Thanks, Pete. I added Flexible Frank to the database." "Wow. I can not belive this. Its just like a human."